One of many B&Bs in the Denali Park area and those looking for McKinley lodging we offer a variety of sleeping accommodations for your Denali vacation. Just minutes from Denali National Park’s main entrance which is just south of Healy. 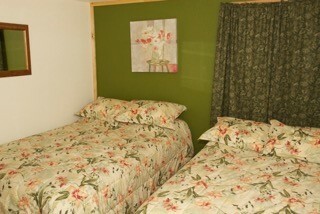 Two short miles from the highway give Denali’s Faith Hill Lodge quiet, convenient comfort. Faith Hill’s 3000 sq ft main Lodge can be configured to a variety of living accommodations ideal for self-catering with a full kitchen, baths, and laundry, sleeps up to 16 people. While planning for your Denali Park vacation our Denali Park lodging offers many features not available while on an Alaska vacation. We offer a variety of sleeping accommodations that have use of a full kitchen, BBQ picnic areas and laundry to allow you to save on your Alaska vacation. You may choose to use our facilities for cooking your own meals so you may not have to spend time and money eating out or waiting for laundry while visiting our Denali Park lodge. Or, after you enjoy our great breakfast, you may prefer that we pack you a lunch, at a very reasonable price, for wherever you might go during your stay at our Denali lodge. When choosing Denali Park lodging one would hope to find a place that gave the feeling that they had an Alaska vacation in a place that was truly Alaska in their overall experience and Denali’s Faith Hill lodge delivers just that without sacrificing comfort. Our outstanding common area has kitchen, living and dining areas inside and out with a terrific view of the Nenana River basin where our guests can truly enjoy their Denali Park vacation. Our Denali Park lodging is located just minutes from the main entrance of Denali National Park making your Denali park vacation easy and private. Our location on the north end of Healy is two short miles from the highway and will give your Alaska vacation quiet, convenient comfort in a setting not generally found in a Denali Park lodge.